Daniel Boone is one of the most famous American explorers. He was a highly skilled hunter, tracker and marksman. He also led the exploration and settlement of Kentucky. He was born in 1734 in the Oley Valley, near Reading, Pennsylvania. His father Squire Boone was a Quaker weaver and blacksmith. Daniel learned blacksmithing and had very little formal education. He got his first rifle at the age of 11 years and killed his first bear at the age of 14 years old. People often said about him, that he could shoot a tick off of a bear’s back. In 1767 Daniel Boone led an expedition for the first time. He discovered the Cumberland Gap. He made another expedition in Kentucky in 1775 and helped to carve out the Wilderness Road. Boone is also famous for building a fort and starting a settlement called Boonesborough. He married Rebecca Bryan on August 14th 1756 and settled down in Yadkin Valley. They had 10 children together. In 1778, Boone was captured by a group of Shawnees, but after some time he managed to escape. In 1789 he was appointed lieutenant colonel of Kanawha County and its legislative delegate in 1791. He also worked as an agent for Richard Henderson and his Transylvania Company. 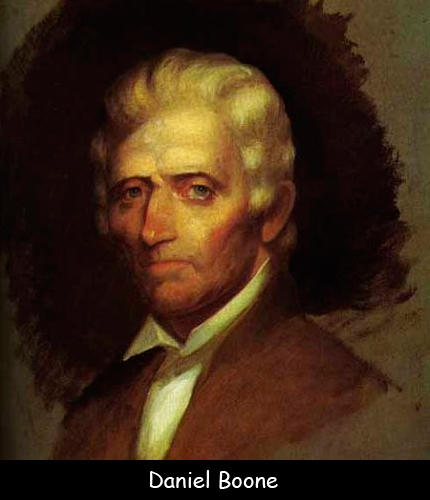 Daniel Boone died on September 26, 1820, in present-day Defiance, Missouri. He was 86 years. Declan, Tobin. " Daniel Boone Facts for Kids ." Easy Science for Kids, Apr 2019. Web. 23 Apr 2019. < https://easyscienceforkids.com/daniel-boone/ >.